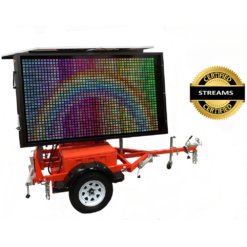 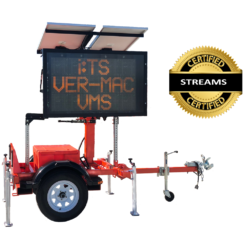 Intelligent Traffic Systems offer a cost effective range of durable Mobile Solar Powered LED Variable Message Sign Trailers (VMS) built to Australian Standard 4852.2—2009 that you can rely on for your day to day traffic management operations. 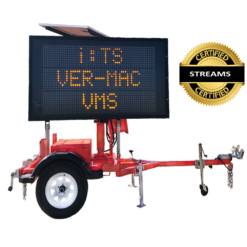 The versatility and ease of programming of our Variable Message Sign Trailers means that they can be used for many different applications such as advance warning messages, traffic calming, speed radar advisory, real time programming and general advertising. 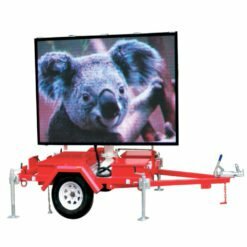 All our Variable Message Sign trailers are heavy duty steel with powder coated paint as the finish, have a 2 year warranty backed up by nationwide parts and service and can be customised to suit your needs. 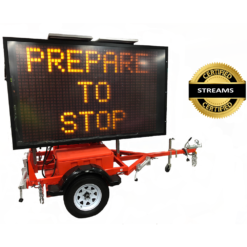 Optional upgrades available include speed radar for driver feedback and anti-graffiti coatings.